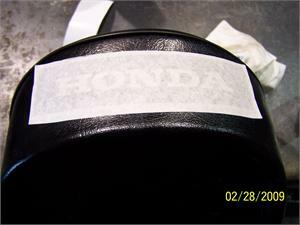 Seat stencil for the Honda Trail 70 replacement seats. The seat must be cleaned where the stencil is to be placed, use a good cleaner to remove oil and dirt. We recommend using the KRYLON fusion spray paint made for plastics. When painting spray light coats of paint, DO NOT SPRAY HEAVY COATS OF PAINT, the paint will be too heavy and not bond to the seat. We do at least 5-8 light coats of paint to get the best results. Remember to use newspaper and tape to cover the seat and protect it from over spray. After painting, use a razor blade to lightly remove the small centerpieces of stencil. It is best to remove the stencil from the seat while the paint is still tacky; if you let paint dry, it may rip the paint.